The Hindustan Times reports that Indian Ministry of Defence (MoD) panel has recommended that New Delhi participate in the Sukhoi Su-57 – i.e. T-50 PAK-FA (or custom FGFA for India) – stealth fighter program as a co-development and co-production partner. The panel is reportedly headed by retired Indian Air Force (IAF) Air Marshal Simhakutty Varthaman, who did not disclose the panel’s findings, but confirmed that its function was complete. 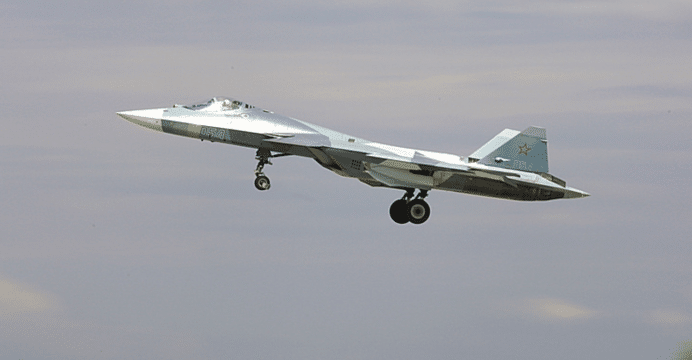 The panel was raised in February with the mandate to examine the feasibility of the PAK-FA. The Su-57/PAK-FA is a heavyweight twin-engine fighter design. It is powered by 117S turbofans, which are also the engines of the Sukhoi Su-35. Among the Su-57’s marquee features is its low radar cross-section (RCS) airframe, which aims to reduce its detectability on radar. From New Delhi’s perspective, it appears that the high costs of the PAK-FA are borne from the platform’s design still not meeting IAF requirements, such as a lack of certifiable active electronically-scanned array radar and Moscow’s own lack of interest in the program. In July, Russian defence industry analysts and observers have told IHS Jane’s that the Russian Aerospace Forces (VKS) was not pushing for the PAK-FA as the platform does not offer a substantive improvement in value over the Sukhoi Su-35, one of the VKS’ emerging mainstay fighter platforms. United Aircraft Corporation (UAC) stated (via TASS News Agency) that development of the T-50 PAK-FA is scheduled for completion in 2019. UAC will deliver a “pre-production batch” of the fighters, at which point UAC expects the VKS to begin issuing orders. However, analysts are unconvinced that the VKS will acquire more than 60 of the launch Su-57 variant. These two elements, i.e. incomplete technology/subsystems and no domestic orders at launch, leave the PAK-FA as an expensive and uncertain proposition for prospective customers, including India, which has a spate of competing priorities – such as an Indian Navy requirement for 57 carrier-borne fighters and IAF requirement for new single-engine fighters – to manage in the short and medium-terms. India also has a homegrown next-generation fighter program in the Hindustan Aeronautics Limited (HAL) Advanced Medium Combat Aircraft (AMCA). Although some have recommended investing in the PAK-FA to secure vital expertise and technology for the AMCA, the IAF and IN’s apparent inclination to Western fighters could enable India to acquire analogous collaborative support from Dassault, Airbus and/or Saab instead. In fact, New Delhi can potentially leverage its IAF and IN bids to supporting the AMCA.